The front of the Coburg finial features skillfully fashioned and beautifully decorated reflectors that will simply dazzle in the glow of holiday lights. 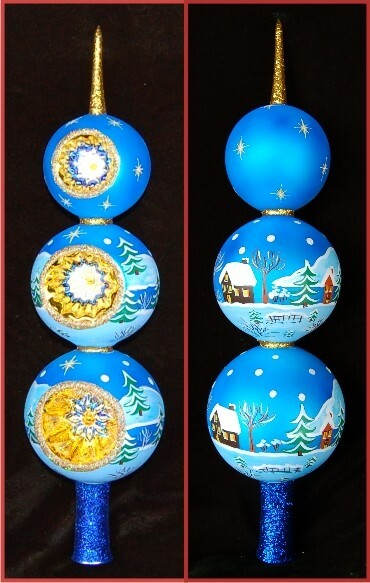 The remainder of the globes made from Polish blown glass displays peaceful and picturesque winter scenes hand painted by Old World artisans. This level of quality and beauty is rarely found together, and we're so glad we can offer it to you in this Coburg glass finial that is just one of many handcrafted Christmas tree toppers you'll find at Russell Rhodes. This instant heirloom is a wonderful choice for your own tree or as a truly unique gift for someone special.